The lamps of Anfora are characterised by tradition and elegance. The simple arms set up the importance of the blown glass shades that are cut and decorated by hand. Clear drops complete the range giving it a further touch of light. 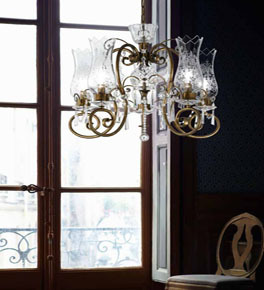 This collection includes chandeliers, wall lights and table lamps. Anfora is Italian for Amphora - an Ancient Greek and Roman ceramic container design.